Shelby McGuinness' luck ran out the day her daddy up and left her family high-and-dry in Dare River. But she pulled herself up by her boot straps to become a successful accountant working for a powerful, if eccentric Southern business woman whose estate houses a magical fountain. 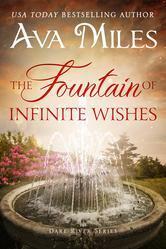 As Shelby risks everything to uncover the secret of her father's abandonment with the assistance of the magnetic private investigator, Vander Montgomery, the fountain helps her remember that wishes are always infinite and a family's road back to reconciliation and happiness is always possible. I have been waiting forever it seems for this latest installment from Ava Miles!!! The wait was worth it!!! I loved Vander from the beginning, you can't help but to love him really. He's going through some tough things when he is hired by Shelby to find her father. Shelby and her siblings always wondered where he had gone and why, but their mother wouldn't speak of it!! What a mystery!!! I loved watching these two fall for each other. Shelby is a character for sure lol, when something happens that hurts and pisses her off I love what she does lmao. **Burnt cake anyone?? ** This was a beautiful story from beginning to end, I was SHOCKED at the truth as you will be. I rated this one four stars because it was just amazing! !